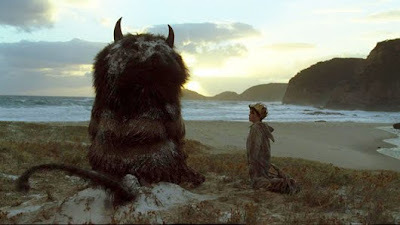 Is "Where the Wild Things Are" truly that strange of a movie? 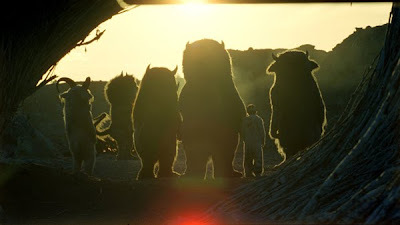 The discussion, confusion and posturing over "Where the Wild Things Are" should suggest that this is a movie that, love it or hate it, is going to be remembered for a very long time. Long after some producer has decided to remake "Cloudy with a Chance for Meatballs" for the Nth time, the audience of today for "Where the Wild Things Are" is going to look upon all comers looking to re-make with a crooked eye-brow, in much the same way as many of us are still not fully accepting of Burton's rendition of "Charlie and the Chocolate Factory". Reviewers and social critics like to state frequently how sophisticated children are as an audience compared to when "we" were kids, but I've always found that claim debatable. Children are new. They are a transitory audience that becomes "us" in short order. The concept of children as an audience "growing" and becoming more sophisticated is a bit misleading. Instead, what we are willing to believe children can understand via our current storytelling tastes is what changes. And we all know that the stories we enjoyed as children were never as simple as the ones we think are "safe" for our own kids. And, yes, all signs point to the fact that their malleable little noggins can adapt to whatever we throw at them, but in many ways that's "us", not "they" who are taking the narrative chances. Is "Where the Wild Things Are" safe for kids? I'll assume you've got an understanding and appreciation for Sendak's book upon which the movie is based. What you may not recall is that the book is razor thin, with something around 12 sentences of copy, and relying upon imagery to tell the story. So the fact that Max is a wee bit out of control should come as no surprise. At this point you've no doubt heard that the Max of the film comes from a home with an absent father, a sister going off on her own path as a teenager, and a struggling single mother who would like to be on the dating scene again. All this is intended to contextualize Max's wild behavior. The movie presents us with these facts in an understated manner, giving us what we can understand as the turmoil in Max's life via his own perspective. The exposition is clear, but does not beat itself out in obvious dialog. And I am not sure what it says that some reviewers seem to take this slice-of-life approach as being "scary" to kids, or "not-for-kids", when we more or less know that this is exactly what a large portion of kids see in their own homes. 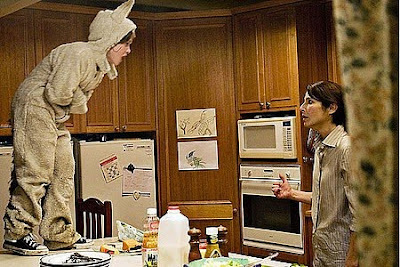 Eggers' and Jonze's approach to the actual Wild Things is only occasionally menacing, and there's never any doubt that a terrible fate could, in fact, await Max. Its that uneasiness and lack of comfort that parents may find worrisome. If the viewer's goal is to spend two hours watching dancing, wise cracking celebrity voices in anthropomorphic animal form scroll past the screen, then, no... this may not be the movie for you, and I'd argue that you may have wished to review the book before buying your ticket. 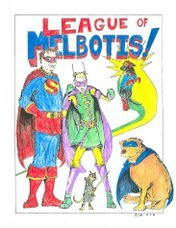 Max and his companions are caught in the frustrating, confusing throes of late childhood, where actions have consequences, and your own inability to express or resolve your own needs can be the basis for a perfect storm. And there's a suggestion that neither child or adult really ever moves past that. It's, of course, not so much a heart warming message that we normally count on in kiddie entertainment (being yourself here is only tangentially a moral lesson), but an acknowledgment to its younger audience and a reminder to its older audience, who may be laboring under the illusion that things change all that much when it comes to how we deal with disappointment, loneliness and quarrels within the family. I do want to mention that I saw at least one review who took the "rumpussing" as a sign of Jonze making an anti-war stance. Had I not read that particular comment, the idea wouldn't have ever popped into mind while I watched the movie, and its my opinion that Eggers and Jonze didn't intend for that to be the case, at least directly (although you could draw out that conclusion if you stretched out the greater meaning of doing harm to one another). My comments above are how I read Eggers and Jonze's movie, but to my eyes, the movie has an open-endedness you rarely see. The movie provides an ending and closure, without a clearly stated "and here's what we learned today, kids" to wrap up the movie, and it may be the lack of such a concise message that reviewers and audiences have felt discomfort with the movie. I'd also read reviews that seemed to, quite, literally, not understand the movie at all (I read one review in which the reviewer firmly believed the island was disintegrating around the Wild Things, I guess because the movie showed different types of terrain...?). So, yeah, this is a different one. Technically, the movie is stunning. 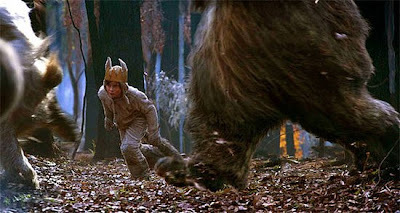 The Wild Things are absolutely believable, and would make Jim Henson a very happy man were he alive today. The puppeteers and CGi artists manage to achieve the result of all great FX characters: you are likely to forget that the characters are an effect and look upon them as characters, first. There's a late-afternoon quality to the light, like maybe just before you'd get called home to dinner or homework, giving the movie a glow throughout. What sets are built seemed mostly practical, and were terrifically structured. While not always as lush as Sendak's pages, the design is stunning in virtually every shot of the movie. The kid who plays Max feels 100% more like any actual kid you've dealt with than the usual Disney-Channel approved child actors. He's allowed to be selfish and ridiculous, silly and scared and brave, and pulls off vulnerable without being twee. Voice actors are a surprising all-star cast, with stand outs from James Gandolfini, Catherine O'Hara and Forest Whitaker. By not playing cartoons, the actors give depth to their characters that's never too broad and feels firmly rooted (it doesn't hurt that the Wil Things have names like Alexander and Ira). And, of course, Catherine Keener plays Max's mother, and she is great, because that's what Keener does. (That, and continually find herself a little higher on the DITMTLOD list). The movie is a bit harrowing, with large emotional arcs for most of the characters. And to that end, I'd like to see the movie again fairly soon to make a bit more sense of KW's relationship with "Terry and Bob", which I was just starting to feel like I could patch into some sort of analogy when the storyline went elsewhere. Carter Burwell (Fargo, Miller's Crossing, etc...) and Karen O (The Yeah, Yeah, Yeah's) put together what may become one of the best scores/ sound tracks in a long time. Enough so that you almost forget the beautifully cut trailer featuring Arcade Fire's "Wake Up". So is it too scary? Is uncertainty in how your child will react such a bad thing? Final Verdict: "Where the Wild Things Are" is a true all-ages film which pulls few punches in examining how people who should be close together, be it family or friends, can pull from one another's orbit, and refuses to give its characters neat solutions. Your mileage will certainly vary, and what you feel your kids are ready to watch is something you're going to judge better than I. But in the end, there's no objectionable material. And if we're considering seeing kids almost get hurt in a movie as objectionable... It may be time to remove the rubber padding from underneath the playscapes and not insist on elbow pads when the kids get on a bicycle. Putting a helmet on to protect from a momentary emotional bruise from the movie may be less a good idea than talking it through with your kid. Few will be able to dispute the technical achievement of the movie, and so love it or hate it, its got that going for it. The movie respects the audience, perhaps giving too much credit at times, and refuses to oversimplify or gloss over the complications presented, while still returning Max to his mother, who has dinner waiting for him when he returns home. I'd see it before it leaves theaters, if you can. Before reading this I did not want to see it. I haven't seen the film and my opinion is almost completely uneducated, but I think I agree with Maurice Sendak here. TY BURR: Let's dispense with the preliminaries: What do the experts think of "Where the Wild Things Are''? As the end credits rolled, my 12-year-old daughter and her bestest friend turned to me with faces like the twin masks of comedy and tragedy on a Broadway playbill. One girl's eyes were wet with tears of sadness and profound joy; "I loved it,'' she sighed. The other looked as if someone had stuck an egg-beater in her ear and scrambled her brains. "That is not a children's movie,'' she growled. ... James Gandolfini turns out to have exactly the rough-tough-creampuff vocal inflections a child's best beast needs. When Carol sulks (which is a lot), it carries weight and it breaks your heart because that voice is so evenly split between menace and the cuddles. Gandolfini gives a great, awards-worthy performance and you never even see the man. The original "Where the Wild Things Are'' is a parable about self-control for very young children - about the joys and dangers of letting fantasy run free, and about learning for oneself when to rein it in. Jonze's film (to which Sendak has given his blessing) visualizes the process of learning control, and its keynote is anxiety - the characters see and are saddened by the gap between what's broken and how little we can do to fix it. Told the owls will answer only seven-word questions, Max asks "How do I make everyone O-K?'' and the answer is an undecipherable squawk that means: Figure it out for yourself, kid. Because Max is a boy and not a Wild Thing, we have faith he will. The moral is tucked away where you can't see it, but it's there. By this point you may have realized that this version of "Where the Wilds Things Are'' isn't about childhood at all but about childhood's end and what's gained and lost by it. That's why very young kids, dull Disney princesses, overprotective parents, and self-serious grown-ups should probably stay away, while the college students after the screening I was at gathered outside and talked in low, exultant voices. That's why the 12-year-old next to me wept: For everything from which she had so recently sailed away. Long comments are (usually) welcome. I am not so sure that "it's not a kids movie" is true. Its whether or not your kid wants to deal with the message, and short of that, the tone of the movie. I'd also say, this isn't a movie where A = A. Jonze and Eggers ask you to work, as much as if you're reading a book. Your mileage there is going to vary. I don't disagree with what Ty Burr says, but find his statement that "its about very young children" and then following that up with "its about childhood's end" a few paragraphs later a bit confusing. I agree that it IS about childhood's end, and Max is cast as a kid on the edge of tween-hood, when kids who are "wild" can be dangerous both emotionally and physically. There are great differences between 6, 9 and 12 year olds, and I'd certainly say the movie skews toward the older end of that range. [spoilers] I don't mean to insult anyone here, but I honestly don't see how anyone could walk away from that movie having not found at least some amount of metaphor in it. KW is leaving her family of Things and venturing out on her own to make new friends, leaving the Things behind to feel rejected in the same way that Max's sister, Claire is leaving Max behind to spend more time hanging out with new high school friends. Carol destroys things to express his disappointment and rage, clearly in the same destructive way that Max expresses his own anger and sadness at being abandoned by his sister. Ultimately, as king of the Things, Max comes to realize that he lacks the ability to perpetually, magically shield his subjects from unhappiness, and he comes to empathize with his mother's own limitations in satisfying his emotional needs. And I think there's even a great deal more going on in the movie than what I've just mentioned, but these are just some of the more obvious examples. I found the movie to be profound in ways that I just didn't expect, but in ways which were, actually, still in keeping with the themes of the book. There are messages in this movie about the need for emotional control and maturity that are important for both kids and adults alike, and the movie conveys them in a graceful, imaginative (and in my mind, sort of beautiful) way. Anyway, obviously I really liked the movie. I think that people should give it a chance (or a second chance in some cases).